As we mentioned in the Art of Motion- The major October Events in Santorini article, the month of October is probably the most intriguing month in terms of athletic events and religious festivities that take place in Santorini during this month. If you are keen on swimming and running, the Santorini Experience event is your chance to enjoy your favourite sports with the amazing beauty of Santorini’s landscape. Santorini Experience is a swimming or/ and running competition that takes place in Santorini from the 6th to the 8th of October. 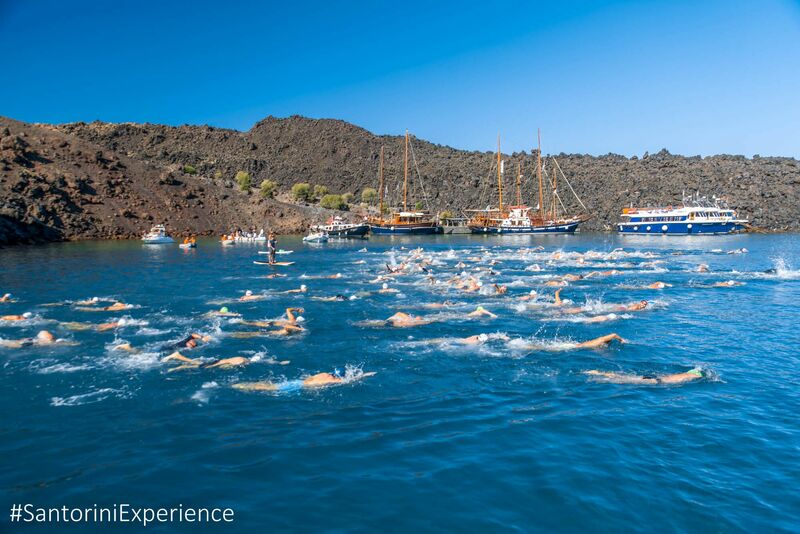 The event is divided into two parts where athletes or just swimming and running enthusiasts can compete in swimming to the waters of the volcano or run in a designated route in Santorini! More specifically for running there is 3 different routes of 5, 10 or 15 km. This will take place on Saturday the 7th of October. The next day the swimming competition is on, where participants have to swim from the Old Port of Fira to the Volcano of Santorini; this is a fascinating sea experience in Santorini. For more details visit www.santorini-experience.com. As we reaching the last days of October and happens to be in Santorini, do not miss the important religious celebration in Santorini and the festivities at St Matrona church in the traditional settlement of Finikia. The day of celebration is the 20th of October but the festivity is taking place the night before. Music, food and dance in probably the most traditional expression of everyday life in Santorini. This is actually one of the few dates that you can experience an old day event coming to today! Whenever you are in Santorini during the month of October just check these dates and make sure that you attend the major October events in Santorini!